Reflecting its longstanding commitment to develop and build vehicles in the markets where they are sold, American Honda took four of the top ten spots in Cars.com 2018 American-Made Index. Topping any other automaker, American Honda vehicles included the 2018 Honda Odyssey minivan, 2018 Honda Ridgeline mid-size pickup truck, 2018 Honda Pilot SUV and 2018 Acura MDX luxury SUV. Now In-Stock at Ralph Honda! There’s no better feeling than arriving in a car as beautiful and sleek as the all-new Honda Insight, except the satisfaction of knowing that it’s also a hybrid. With stunning design and an impressive fuel economy rating of 55-mpg city (LX and EX),* the Insight always makes an entrance. Driving in summer heat can take a toll on your car, but there are steps you can take to keep your vehicle out of trouble. You know that extreme cold can take a toll on your car, but did you know that extreme heat can do a number on your vehicle too? Beyond making your legs stick to your leather seats, the heat can cause serious problems for drivers. As summer approaches, it’s important to prepare for the hot weather ahead. The most important thing to do to keep heat-related problems away is to maintain your car. • Coolant: This is the big one. If your coolant/antifreeze level is too low, it can cause overheating. If you’re a car expert, you can examine the belts and hoses in your vehicle yourself—but if you’re like most of us, you’re better off having a professional mechanic look them over. Intense heat can cause cracking, blistering, and other damage to your belts and hoses, and they may need to be replaced. If your car has an old battery, extreme summer heat can spell trouble. To avoid expensive repairs, it’s worth having your car’s battery tested, or even replaced–getting a new battery altogether will cost you less than it would to have a dead battery serviced if your car breaks down. It’s a good idea to check your tire pressure each time you visit the gas station (or, if you own a tire pressure gauge, you can do this at home). Your tires actually expand when exposed to heat, and keeping them at the proper pressure will ensure that your vehicle doesn’t suffer from any issues. Having these things on hand could just end up being a lifesaver, should you ever need them. Having the right amount of coolant for your engine is essential, but on extremely hot summer days, having a vehicle interior that is cool enough for you to actually drive in is important too. Before the heat hits too hard, make sure your air conditioning system is running properly. If your vehicle has a cabin air filter, have it inspected (and replaced, if necessary) so that you can get the most out of your cooling system. Highways are typically better maintained than regular streets, and are better equipped to handle extreme heat. Just remember the importance of maintaining your tires—the last thing you want is a tire blowout on the highway. Ralph Honda is proud to lend a hand to the Greece Ecumenical Food Shelf that supports our community. Recently, a few Ralph Honda team members — Rhonda Breedlove, Dave Buelman, Chuck McGarry & Brandy McCaffrey — volunteered by restocking the shelves at the Food Shelf. Over the past several months the Greece Ecumenical Food Shelf Board has been hard at work developing plans to better serve our hungry neighbors by implementing Client Choice. Our new direction will allow individuals to choose the food for their families, reducing packing costs, and provide new opportunities for our volunteers. Four positions have been created to support coming to our site to choose their food: Shopping Assistants, Restockers, Foodlink Shoppers and Perishable Products Manager. New volunteers and current volunteers who would like to expand their involvement in the Food Shelf can call our Volunteer Coordinator, Polly McCubbin at (585) 489-7729 or email her at gefs.volunteer@gmail.com. To learn more about the Greece Ecumenical Food Shelf, please visit their Facebook page HERE. 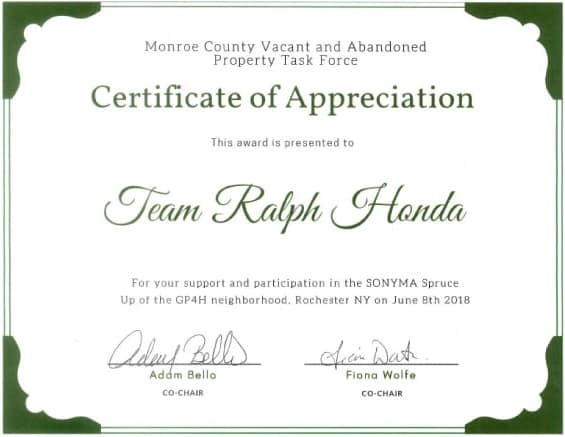 Ralph Honda supported the GP4H Neighborhood Spruce Up by volunteering on June 8th to help the Monroe County community. In total, they spruced up 35 occupied homes, 8 vacant homes, 7 lots and the 4th St Park! While everyone received landscaping, some homes received glass block window, new porches/stairs, mailboxes, porch lights and had repairs/painting done to fences and railings. Congratulations to Angela & Angel Merced on the birth of their daughter!!! 2. Fold up all sides of each of 4 large sheets heavy-duty foil to form 1-inch rim; spray with cooking spray. 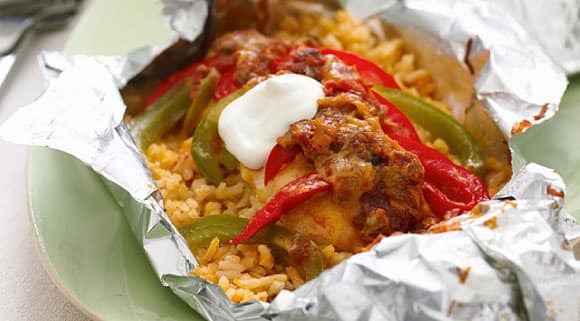 Combine rice, hot water and taco seasoning mix; spoon evenly onto foil. Top with remaining ingredients. 3. Bring up foil sides; fold to make 4 packets. Place on rimmed baking sheet. 4. Bake 30 to 35 min. or until chicken is done (165ºF). Cool 5 min. Cut slits in foil to release steam before carefully opening packets.